Need help getting started with your own e-commerce project? E-commerce should be a part of every small business. It can be as simple as becoming an affiliate of Amazon, or as full-featured as a unique online store with integrated checkout. E-commerce also includes productivity tools like links to schedule appointments and systems to send out e-mail marketing reminders to prospective clients to get them to order online. No matter your need, our services can help you get started in the right direction. First and most importantly, we have no specified agenda or affiliations with certain firms that pay us a commission. Everything we recommend will be to help you! You might wonder why we feel qualified to assist you and that’s a good question. The answer is that we've been using e-commerce to generate revenue for over 15 years. In other words, we’re doing what you want to be doing! 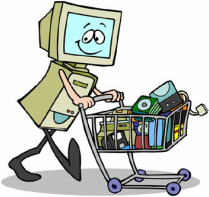 If you’re overwhelmed by the world of e-commerce but don’t feel like you can set up or operate it without assistance, why not let us help you? We’ll begin by determining what you think you would like to do with e-commerce. We’ll then look at the different tools, technologies, and methods available that will allow you to do the things that you want to do. If you're not sure about what you would like to do in the world of e-commerce, we’ll explain the different methods available to you along with the pros, cons, and investments in both time and money that you will have to make in order to participate. The next step will be to determine when you would like to start, how much time you're in a position to invest, and how much capital you want to commit to get involved. Once you've decided what you want to do, and which of the processes you want to become involved in, we’ll research what's currently available and give you a written recommendation as to what we feel you should be using to accomplish your goals. This process can be accomplished through a combination of telephone and e-mail communications and will take approximately 1 week from the time we hold initial telephone consultation until the final report is in your hands. We’ll help you to determine whether you want to alter or expand your business to accommodate the requirements of ecommerce or if you’re starting your own, new, e-commerce business. For example, if you’re going to be starting a new business, especially if it involves goods, you must essentially go into the mail-order business and that involves logistics and facilities. Do you have storage and shipping space available or can you obtain it at a reasonable cost? One viable alternative is to develop relationships with drop shipping firms who will warehouse and ship for you thereby eliminating the need for you to purchase and warehouse the goods. Once you've set up shop, you’ll be in a position to modify your site without our assistance and participate in the world of e-commerce. The total cost for the analysis and recommendations is $695, payable in advance. Additional charges may include monthly web charges, which should be less than $25 per month, and includes the domain name, website software, hosting fees, and pay-per-download services for the sales and delivery of virtual goods. We also have custom graphic design services available at additional charges ans will be happy to share those resources with you at no charge.